At Active Health Chiropractic, Dr. Kmiec supports your journey to pain relief, wellness and health by offering effective chiropractic care as well as massage therapy, complete rehabilitation programs, weight loss, orthotics and general life coaching. Dr. Kmiec and her staff treat a variety of age groups. 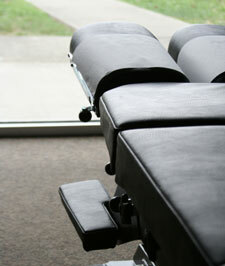 At Active Health Chiropractic, we offer massage therapy to our patients and often incorporate it into your treatment. Massage Therapy is a treatment that allows Dr. Kmiec, or in some cases her licensed massage therapist, to work on tight muscles which helps to reduce muscle spasms. We want you to relax while you are here and feel that relaxation is a strong part of the healing process.